Well, the process leading to recognition of my Italian citizenship continues to move forward. (See this post for some background information, if you don’t know what I’m talking about.) Last week I received a nice batch of documents (birth and marriage certificates) from the state of Delaware, which constitute a fairly decent percentage of all the documents I need. But I still need a few things from Pennsylvania, Texas, the federal government, and the town of Cassine in Italy. But it is moving forward. You learn some interesting things while gathering up all this family historical stuff. For example, on my mother’s birth certificate, her father listed his occupation as “Billiard Parlor.” I never knew that. All the time I knew my maternal grandparents, they operated a little corner lunch counter. Never knew anything about a billiard parlor. This would have been in 1929. Another thing you learn is how sloppy the official record-keeping was at that time (and may still be, for all I know). Again on my mother’s birth certificate, they really mangled the names. They used my grandmother’s maiden name as the family’s last name, and the actual family last name as my mother’s middle name. Because of this, the people in Delaware had a lot of trouble actually locating this record for me in the first place. But a guy named Bruce at the Delaware Public Archives somehow tracked it down (Thank you, Bruce!! ), then had it amended to reflect the actual facts of the situation. I am a member of a Facebook group for people who have or are seeking recognition of their dual U.S.-Italian citizenship status, and mistakes like these seem to be quite commonplace. The records people find are riddled with errors. Maiden names are used as last names. Italian names are Anglicized, but inconsistently — the Italian name used in some records, the English version in others. Names are misspelled, or sometimes changed completely. All kinds of mistakes. This creates headaches for people like me, because the Italian consulates who examine these documents like all the i’s dotted and all the t’s crossed. 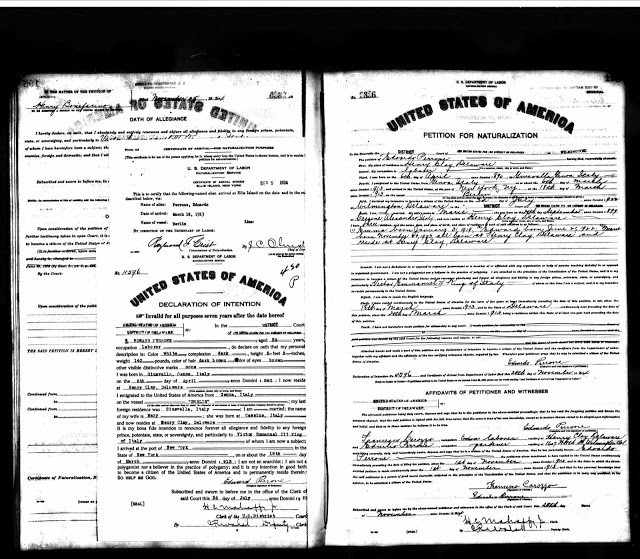 How do they know that “Concettina Giliberto Rollo” on the (incorrect) birth certificate and “Concetta Mary Giliberto” on the (correct) marriage certificate are the same person? Obviously they don’t. And they can’t just take your word for it. So it is a sometimes enjoyable, sometimes maddeningly frustrating process. I have actually been having better luck than a lot of people, so I am grateful for that. I only have to go back two generations, and I pretty much know where all the records are. It’s just a matter of getting them collected and into the proper formats. Some people have to go back to their great- or even great-great-grandparents. They may not even know who some of these people are, let alone how to find their birth, marriage, immigration, naturalization, and death records. In some U.S. states, the only person who can request someone’s birth certificate is that person themselves. Huh? What happens if that person is long dead? So far, the most frustrating thing for me has been the wait. For example, I paid an agency of the U.S. government $20 last December to order an index search of their database. It is now just about three months later, and I still don’t have a thing. Imagine ordering a product from a private company and not receiving it for three months! And this index search is only the first step. Once I receive that, then I use it to actually order the documents that I need. And wait another 3-4 months…. Fortunately, most of the state agencies I’ve dealt with have been fast, efficient, and very helpful. So things are moving along. With any luck, my citizenship will be recognized sooner rather than later. In the meantime, I’m learning a great deal, and I’ve met (online) a bunch of nice people with whom I share this entire experience.